The "Wizard" was a couple of hundred miles directly in front of me on our way to Africa when it sank. Here's the story. The Wizard, a Durban-registered yacht, sinks to the bottom of the Indian Ocean after it apparently struck a floating container about 500 nautical miles off the coast of South Africa on November 3. For the five-man crew of the Durban-registered Wizard, the yacht was more than a vessel that took them from one exotic destination to the next. And when it sank to its watery grave earlier this month it was a tragic moment for them all. 'These things almost have a soul of their own,' said John Brownhill, a 59-year-old UK-born man who now lives in Joburg and had spent four years aboard Wizard. 'It was very much part of our lives. So when it went down a great sadness fell,' Brownhill recalled. The Wizard was sailing towards its home port of Durban after a four-year stint on the high seas when it reportedly struck a floating container about 500 nautical miles off South Africa on November 3. On board at the time were the skipper and owner of the boat, Vanderbijlpark businessman Gerrie Boshoff, Rodney Beresford, Japanese national Shin Terasawa, Doug McLeod of Australia and Brownhill. Rodney Beresford, a crew member of the Wizard, watches the stricken vessel sink to its watery grave. The yatch was on its way to Durban when tragedy struck. Rodney Beresford, a crew member of the Wizard, watches the stricken vessel sink to its watery grave. The yatch was on its way to Durban when tragedy struck. Boschoff said the wind was blowing at 35 knots and there were 5m-high swells when the incident happened. 'It was pitch dark. I don't know what it was that we hit. But it made a big, puncture-like noise. Within seconds the front of the yacht started filling with water and I knew we were in trouble,' Boshoff said. Up until that point, Brownhill said, they were sailing 'quite nicely'. 'After that hard knock the skipper, Gerrie, came on top and said the boat was taking on water and he told us to get a life raft ready,' Brownhill said. The crew managed to activate the distress radio beacons, known as EPIRB (emergency position-indicating radio beacons). As the crew climbed aboard the life raft, Boshoff retrieved his satellite phone and was able to call a friend in Vanderbijlpark who alerted authorities. Boshoff bought Wizard in 2006 with the intention of sailing it around the world on a 15-month world yacht rally. On January 23, 2008, Wizard crossed the start line of the rally in St Lucia, flying the Royal Natal Yacht Club burgee and the South African flag. During the voyage, Wizard visited numerous countries and ports including Cristobal, Transit Panama Canal, Galapagos, Society Islands, Bora Bora, Tonga, Fiji and Vanuatu. 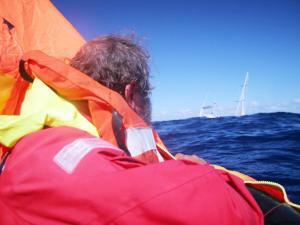 However, in late 2008, Wizard ran into trouble and was dismasted 700 nautical miles from Australia. 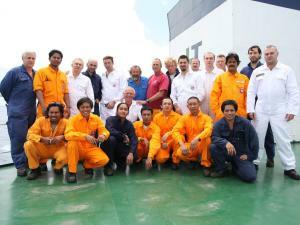 With a jury rig, the crew sailed to Cairns in Australia and arrived there on August 1. For the next three years, Wizard would remain in Cairns while Boshoff battled with insurers to pay for the cost of repairs. During this time, Wizard survived, according to Boshoff, four named cyclones. A tanker, the EVA Schulte, picked up the distress signal from the Wizard's crew and rescued them from their life raft. A tanker, the EVA Schulte, picked up the distress signal from the Wizard's crew and rescued them from their life raft. Thirty-two months after it berthed in Cairns, the insurers paid for repairs. Boshoff, who had returned to South Africa to continue his business, then flew back to Australia where he completed the repairs in- cluding fitting a new mast on Wizard. On August 8, Wizard was seaborne and left Cairns for its final journey home. But as fate would have it, Wizard would hit a floating container in early November that would lead to its ultimate demise. Boshoff said that as Wizard took on water and began slipping into the ocean, his only concern was for his crew. 'Initially I felt little except for the need to ensure that a distress call was transmitted and to ensure that my crew were safely transferred to the life raft. It was only later while we were safely aboard the life raft that a feeling of profound sadness overcame me,' he said. Brownhill said that watching Wizard sink to the bottom of the Indian Ocean was a heart-breaking moment. 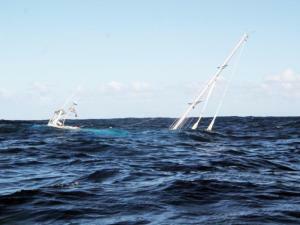 As the yacht sank to its watery grave at the bottom of the ocean, Terasawa took out the camera to document the yacht's final moments. Brownhill said that as they waited for help to arrive the crew did not speak much. 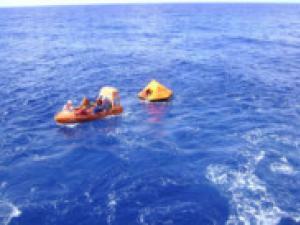 He said that there was no panic among the crew as they were confident that they would be picked up. Ten hours later, a tanker, the EVA Schulte which had been tracking the signal of the EPIRB, found the men. The ship took the men west and dropped them off at Port Louis in Mauritius where they were able to get a flight back to South Africa. 'It was a sad journey back,' Brownhill recalled. Brownhill said the four years aboard Wizard were the best time of his life. 'This was the greatest adventure of my life. Everybody should do it,' he said.